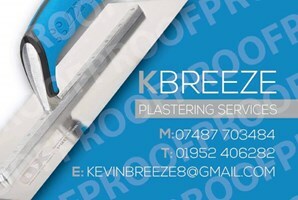 K Breeze Plastering - Plasterer based in Madeley, Shropshire. Hi I'm Kevin I'm a sole trader from the Telford area. I have been plastering for almost 20 years. being taught by family members. I worked for a large company based in Shrewsbury, then moved on to work for myself. We do all aspects of plastering from small domestic patching jobs to large commercial work . Our work is based on reputation, returning customers, and recommendations. We pride ourselves on our customers requirements .